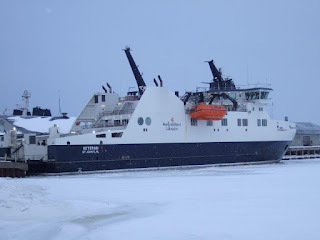 The ferry Legionnaire departed St. John's at 1700hrs Feb 4, 2017 heading for Fogo. The Veteran is going to have 2 weeks of maintenance work completed and while she is out of service, the Legionnaire will fill in. The Veteran is having the work done in Lewisporte, and once the Veteran goes back into service, the Legionnaire will tie up in Lewisporte until she starts the Bell Island run.